Deputy First Minister Martin McGuiness has paid a private visit to an injured police officer at Altnagelvin hospital. 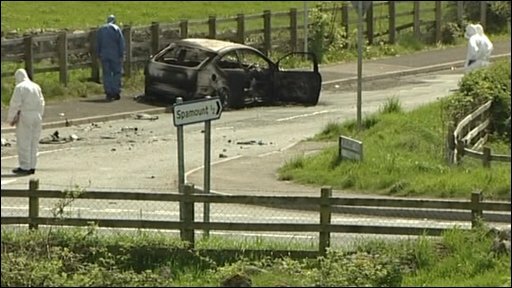 Dissident republicans have been blamed for the booby-trap car bomb attack on the off-duty officer in County Tyrone. The officer, a Catholic, sustained serious, but not life-threatening, leg injuries in the attack on Monday in Spamount village, near Castlederg. 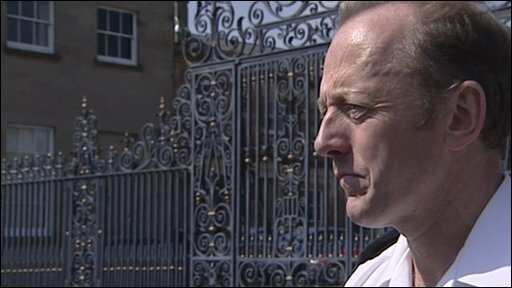 Chief Constable Sir Hugh Orde said off-duty officers were being targeted because they were "most vulnerable". He said dissidents knew they were "in their endgame" and were "lashing out". The explosion happened at Drumnaby Road at about 2130 BST. "They have not defeated the police service for the last 38 years, if they seriously think this sort of event will defeat the Police Service of Northern Ireland they are badly mistaken - I think the communities and the police together can solve this crime," Sir Hugh added. The officer was rescued by a member of the public who dragged him from the wreckage of the car. A short time later the vehicle went on fire. Eye-witness Tommy Sproule said they moved the injured officer a safe distance away from the vehicle. "If we hadn't moved him, he was only about two metres from the boot of the car, his injuries would have been a lot worse than what they were," he said. Northern Ireland's First and Deputy First Minister condemned the attack. Ian Paisley said it was an attack on democracy and that those behind it must be "brought to justice". "My prayers and thoughts are with the policeman and his family at this very difficult time," he said. Deputy First Minister Martin McGuinness appealed for anyone with information to assist the police. "The elements within our society who perpetrated this act have nothing to offer, they are without mandate or strategy and represent no one," he said. The Sinn Fein MP for the area Pat Doherty described it as an "absolute outrage". "We have moved on - there is no turning back to the old days," he said. Police have been warning for some time that dissident groups have been trying to increase their activities and that they were actively targeting police officers. In November, the Real IRA shot two officers in Londonderry and Dungannon, and in February police mounted a huge security operation across Northern Ireland because of fears that dissidents were planning another shooting or bombing.